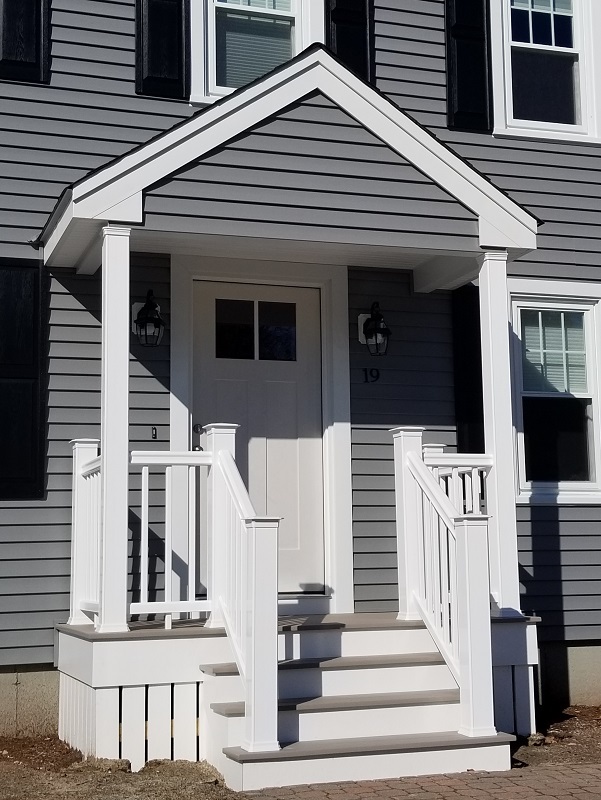 Mastic vinyl siding, Harvey windows, and a beautiful portico added value and curb appeal to this Dartmouth, MA home! These Care Free customers chose Mastic Carvedwood 44 vinyl siding in the color, Deep Granite, for a gorgeous, maintenance-free home exterior. 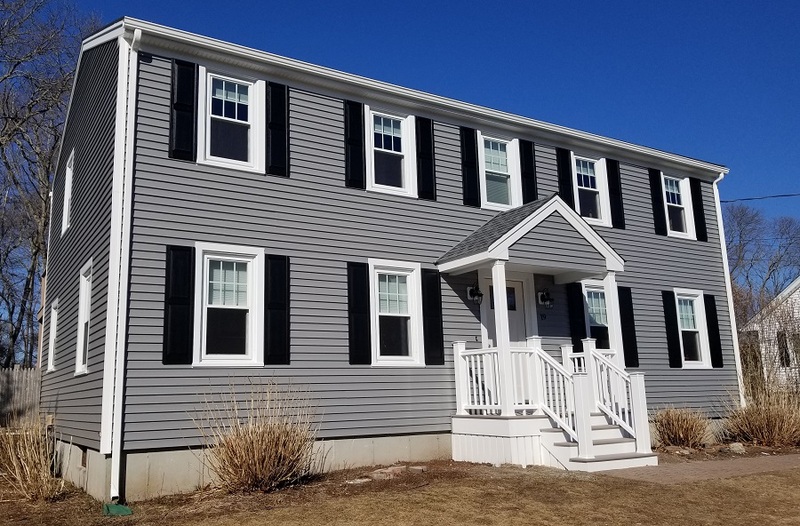 Manufactured to mimic the texture and shadow lines of painted, cedar clapboards, this siding is extra thick and resists dents and cracks from everyday wear and tear. 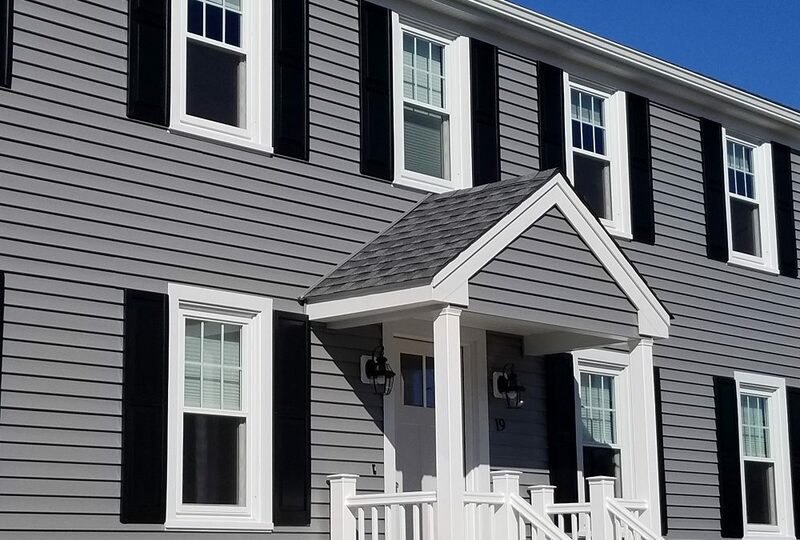 Mastic vinyl siding also comes in an extensive collection of textures, shapes, and colors to suit your personal style – whether you prefer the look of cedar clapboards or cedar shingles – we have the perfect, paint-free siding for you! 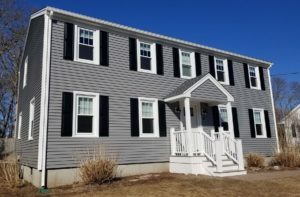 Here at Care Free Homes, we’re proud to be a Mastic Elite Contractor who provides homeowners with custom vinyl siding installation and professional grade product warranties. Harvey Classic vinyl replacement windows, a Care Free customer and family favorite, were installed throughout the home. Manufactured right here in New England, Harvey windows are both beautiful and energy efficient. These double hung, double pane windows are custom made for your home, tilt in for easy cleaning, and come in a variety of grid patterns and colors. As one of the few, hand-selected Harvey Elite Series window dealers, we also offer Harvey’s ultra, triple pane windows. The Elite series provides the same beauty as the traditional Harvey Classic but are super-optimized for energy efficiency. Both window styles provide exceptional performance. 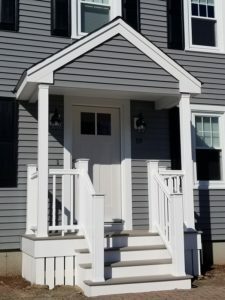 The homeowners also added curb appeal and functionality to their front entryway with a new portico. This covered porch was built using AZEK decking in the color, Slate Gray. 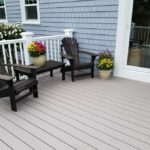 AZEK, a polymer decking, resists rot, insects, scratches, stains, and mold making this our go-to product for maintenance-free decking. It also comes in a gorgeous collection of textures and colors that mimic the look and feel of real wood. AZEK Premier Rails in the color, white, provide a safe, splinter-free, maintenance-free protection. The porch was finished with a vertical, PVC skirt for high quality style. (We encourage you to explore our online portfolio to see other AZEK projects!) A Therma-Tru, Smooth Star entry door provides the homeowner with energy efficient style. When the time comes to give your home exterior a makeover – give us a call! 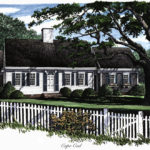 We’ve been serving SouthCoast Massachusetts, Cape Cod, and Eastern Rhode Island homeowners for over 40 years. We provide our customers with outstanding product warranties, professional installation, and reliable customer service. 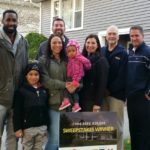 Call (508) 997-1111 to schedule your free quote or contact us online and we’ll be sure to follow up with you. Don’t postpone your project – make your house a Care Free home!